Mrs. Lagergren is Raoul Wallenberg’s sister and Ambassador Per Anger (R.I.P) was a colleague of Wallenberg in Hungary during World War II. Raoul Wallenberg Monument in Stockholm. It was created as a direct link between the Holocaust Monument and the Wallenberg Monument. Granite globe of about 1.2 m in height. On the side toward the bay, the stone bears the inscription Raoul Wallenberg torg; on the opposite side, leading to the Holocaust Monument, is found, Aaron Isaacs Grand. The globe contains the line: “The road was straight, when Jews were deported to death. The road was winding, dangerous and full of obstacles, when Jews were trying to escape from the murderers”. This sentence appears first in Swedish, followed by English and then in 22 languages, beginning with Polish, given that this is the language of the largest group of victims, followed by the other 20 languages of the countries from which the victims originated. The 22 translations underscore the diversity of European Jewry that the Nazis tried to subsume into one homogeneous group. The text makes also clear that it was indeed dangerous and difficult for Jews to escape Nazi persecution, as it was dangerous for those, like Wallenberg, who tried to help them. The Stockholm Hall of Fame consists of 77 portraits of well-known Stockholmers. They come from the worlds of sports, music, culture and art and from the business community. 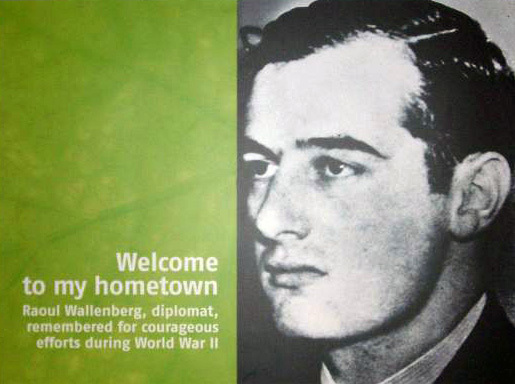 Raoul Wallenberg is one the Stockholmers portrayed. The Stockholm Hall of Fame is a cooperative venture between Stockholm-Arlanda Airport and the City of Stockholm’s Economic Development Agency. Raoul Wallenberg School is a private school organisation (friskola) with students from Years 6-9. 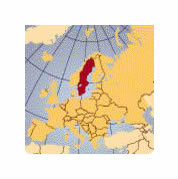 Raoul Wallenberg Schools in Sweden will start the first two schools in Bromma, West Stockholm (2006), and in Nacka South Stockholm (2007). There are many other Raoul Wallenberg Schools around the world. Description: The exhibition tells how the Swedish diplomat Raoul Wallenberg saved the lives of thousands of Jews in Budapest during the final stage of the Nazi occupation of Hungary in 1944-45. Through pictures, sound, light and objects, Wallenberg’s life is evoked, from his early childhood to the repercussion of his disappearance in 1945. Raoul Wallenberg – One man can make a difference is an excellent platform for a further discussion on understanding and civic courage. Description: Charlotte Gyllenhammar’s proposal; The Raoul Wallenberg memorial monument shows a portrait of the young Raoul Wallenberg, on an enamel surface placed on a two meter high white sandstone.One meets the young Raoul Wallenberg, who has not yet met his destiny with its possibilities and tragedies. In front of the photography there is a sculpture of two sleeping boys cased in bronze,who testify the oppression of history. Charlotte Gyllenhammar who has chosen an expression charged with emotions and who has not relinquished to desist from the pathetic and sacred. The mission of this institute is to promote research, training and academic education in the fields of human rights and humanitarian law. in Belgrade (September 19 – 23, 2005). Location: Swedish Parliament in Stockholm. Unveiled on 17 January 2000 in Stockholm. Arquitect: Sar Lars Thurman Zoltan. Name: Raoul Wallenberg Project Interviews. The names of the interviewees and their close family are given as initials. The project is carried out by the University of Uppsala, Sweden. Name: The Raoul Wallenberg Stamp. The Raoul Wallenberg Stamp was issued by the Royal Swedish Postal Service. Swedish Institute in Stockholm, Sweden. Chalmers University of Technology, Medicinaregatan 20A. Name: The Raoul Wallenberg Association. 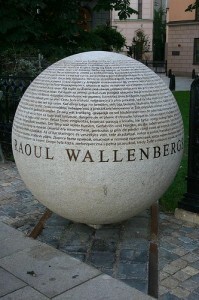 Name: Monument to the achievements of Raoul Wallenberg. 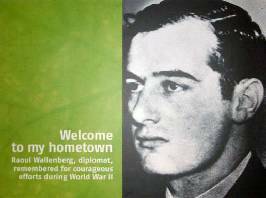 Raoul Wallenberg has become a symbol of the constant struggle against persecution. Inaugurated on May 28th 1999. Location: City park of Lidingö, Raoul Wallenberg’s hometown. Address: Carl Milles väg 2, 181 34 Lidingö. The memorial monument was unveiled on August 25th 2001 by King Carl XVI Gustaf. The ceremony was attended by U.N. Secretary-General Kofi Annan and his wife, Nane Annan, niece of Wallenberg. Name: Documents on Raoul Wallenberg. Documents concerning Raoul Wallenberg made public in accordance with a decision by the Swedish Government. Description: The CD has four tracks and is Ben’s homage to Raoul Wallenberg. With the CD comes a booklet of 24 pages where Ben tells the story of Raoul Wallenberg and his great deeds.